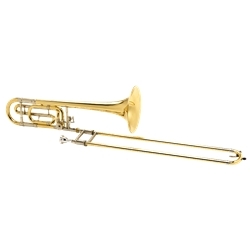 Antoine Courtois Legend 420 trombones have entirely handmade bells which adapt over time to a musician’s playing. With their elegant and homogenous sound, yellow brass bells provide a nice balance between the various playing parameters which make it the most widely used and widely played alloy in the world. Standard slides with narrow nickel silver inner slides allow for precise playing and sound control at any volume throughout its register. In 1976, Orla Ed Thayer developed a mechanism which gives the air column a direct path through the rotary valve, with or without the use of the F attachment. The easily recognizable conical shape reduces air column resistance to a minimum when the air circulates through the valve. Musicians choose this system for its great playing comfort.